These courses are currently full. Stay tuned for the 2015/2016 sessions. 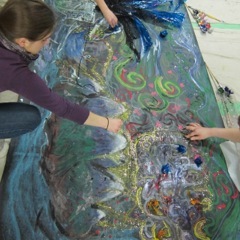 This year-long course will provide further grounding to the art therapy student and practitioner in studio work. Students will have the opportunity to develop their knowledge of materials and artistic processes while developing a deepening familiarity with personal imagery and symbolism. Traditional and non-traditional media and art-directives will be explored. This course will be beneficial to students and practitioners looking to engage with the art therapy process over a longer time span than normally afforded by the week-long intensives. This course is currently full. Stay tuned for the 2015/2016 session! This entry was posted in Upcoming Events on 2014-02-05 by Tatiana Peet.